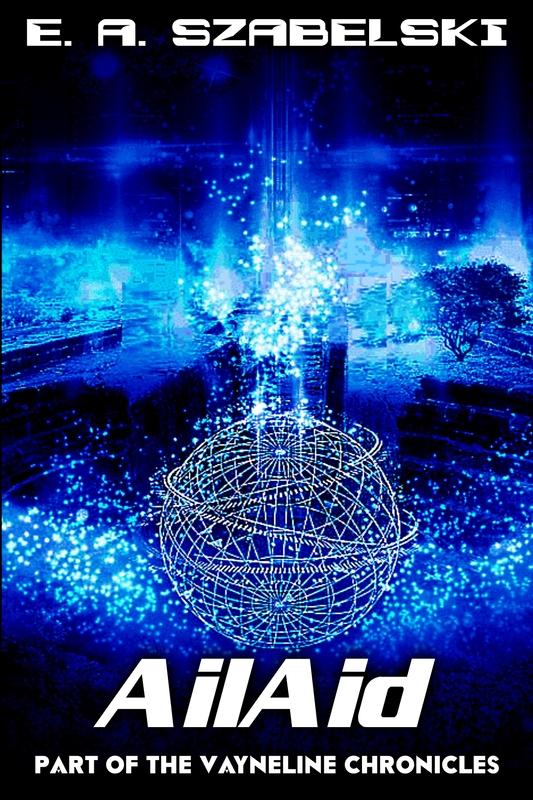 AilAid is a story in the VayneLine Chronicles that tells of a small group of besieged survivors on a dark mining planet. The story introduces ‘Marking’ which is when someone’s hair turns a bright white and is rumored that the planet ‘marks them for death’ and which they often die rapidly by unknown aliens soon after. The story follows three characters, Ria, Bray and Dix who were working at a mining colony that is rapidly overran by aliens that seem to pick their targets before killing them. The story opens with Bray having his hair rapidly turning white, and the entire colony dead except for them bunkered in a kitchen area. Ria starts to have more and more hallucinations of a man she does not know, and in these visions she is often subtly changing actions to insure he is kept alive. The actions often seem like short term breaks of bad luck (tripping, hitting something) and only viewed from a longer context how they saved him from death. The three survivors realize they have one chance and that involves sending out a distress call and prepare to fight their way out. It is then revealed that both Bray and Dix survived not due to luck, but because they are elite soldiers sent in. There is serious doubt as to why Ria is still alive and whether her story of being just a Comm officer is cover for something deeper. What Ria ends up being is far more than anyone imagines. The border between life and death starts to take a new meaning. AilAid is one of the two stories that does not take place extremely near the VayneLine story timeline, it takes place about 1-2 generations before. The other story is Rexrin Protocol. Because of the generational lag, the term ‘Marking’ is in much more wide use. Ria becomes somewhat infamous later in many intelligence circles given her actions during the AilAid story. AilAid is the only VL story that does not have a single swear word in it. The story follows a young girl named Ria. She is one of three people who are still alive after their mining colony is overran by aliens. The other two people are a guy named Bray, and a girl guard named Dix. At the start of the story his hair has begun to turn white which the people believed was a sign of being ‘marked’ for death by the planet. The three survivors have holed up in a kitchen/storage room as the aliens occasionally bash on the door leading them to be constantly on edge. They hear a knock and they get ready to fight, but nothing happens other than them feeling edgy. Ria has a dream where there is a young boy climbing a tree. She affects the outcome where she moves his foot slightly so when he falls he does not die from the fall. In a spiritual sense the boy say ‘as in life’ and Ria responds ‘as in death’. She wakes up and the three of them talk about if the ‘Marking’ was real. They discuss how some people were killed without having the white hair of being Marked. As they talk there is a noise inside the room, the other two fight and Ria is forced to finish off a wounded creature. Ria is disturbed by the humanoid shape of the creature, where it looks like a young woman but had ‘demon-like wings’ that were only partially formed. The wings looked vaguely like Daijin Star wings but highly distorted. Bray tells them how the people who died were exposed to a blue vapor. After talking, Ria goes to sleep having another dream where the boy from earlier is grown up. He is fighting in a war in a city, and a huge missile is going to kill him. She forces him to stagger by hitting a piece of metal, he is delayed enough that is not killed by the explosion. It ends with the chant of ‘as in life’ ‘as in death’ in a subconscious way. Ria tells the others that no distress call was sent out as the comms was overran too fast. They decide to fight their way out as their only hope for rescue. They hand out some force field bracelets, the other two are distrustful of Ria because she knows how to handle the armor and equipment beyond what her job should know. As they head out, a shout of “go go go” causes her to fall out of consciousness and it follows the guy from earlier. The story is from his point of view, surviving the missile blast. Back with Ria she is extremely panicked from being in a fight. As it continues she starts to feel calm from something in her mind. They start to berate her, as there is no way a young girl like Ria is still alive. She starts to cry, and has visions of the male energy which she calls different names including Raist and sees when a pink haired girl dies. She states ‘as in life’ as the vision’s voice tells her to embrace her true nature. Ria’s alternate persona takes over where she is both calm and forceful. She can see the future and sees paths where Bray tries shooting her, but she can easily stop them. She leads the way fighting back to the room, she shoots before she sees the creatures. At one point punches a creature to death and is confused about her wrist being broke. When they make it back to the room, one alien is not seen after Ria loses her connection to the spirit and Bray is killed. Despite that Bray and Dix were not actually together, Dix shows emotion about him being dead. The two of them slowly live out a long period of time, Dix holds Ria responsible. Eventually she kills herself. Ria is slowly dying, repeating ‘as in life’ over and over until she passes out. A rescue time finds her and she is the only survivor. The story ends with her having lived a long life. She is then in an afterlife-type setting where she is discussing with the male energy. She has completed a mission where she relays that the Solarians are advancing technologically and talks about the blue energy. It implies that as a Guardian her and the male energy take turns going through life, with the other one guarding them – like she had to the male in the war, and the male helping her on the colony. It ends with them saying ‘As in life’ ‘as in death’ – the title of the story.